You don’t have to be flexible. I’m always surprised at how many people think they have to be able to bend themselves into a pretzel before coming to yoga. Yoga is all about going as far as your body can take you. Forcing yourself further than you can safely go is about as far from yoga as you can get. I’ve been doing yoga for a few years now and I’m still not all that flexible. My heels don’t touch the ground when I’m in downward dog. They might never get there, but I’m okay with that. No matter what, there’s always a modified pose you can do. You’ll slow down. It took me awhile to realize that yoga, unlike a lot of things in life, isn’t about being fast or being the best. Every time I step into my favourite studio I know I’m in for a treat. The next hour and fifteen minutes will be spent being in the moment. I’ll only be going as fast as my yoga teacher goes. If she or he decides to hold downward dogs a bit longer today, then that’s what I’m going to do too. I’m not going to rush through it, get it over with, and move on with the next thing on my to do list. It’s a welcoming community. Walking into a yoga studio can be intimidating. Trust me, I was there before I attended my first yoga class. But within a few classes I found out that the staff and teachers were awesome. Teachers were open to questions both before and after class if I was having a challenging time with a pose. There’s a pretty cool energy that comes when everyone in the class is giving it their all. It may look different for different people, but they’re all putting in their best effort. It will calm your mind. When I first started doing yoga I had a million things running through my head. “Am I doing this pose right? Did I send that email? Can I touch my toes like the person next to me can?” Eventually I listened to my teachers and realized that yoga is a moving meditation. The more I focus on my breath and the pose I’m doing, the less I worry about distractions or the things that are going on around me. I look forward to classes because I know I’ll have a chunk of time when the only thing I’m focusing on is myself in the present moment. Savasana is such a treat. It might sound funny, but being still in the present moment and not thinking about anything feels incredible. From the moment I wake up in the morning until the moment I drift off to sleep at night, my mind is constantly going. I’m thinking about what I need to get ready for work the next day or what I’m going to make for dinner – the constant stream of thoughts is endless. Savasana at the end of class is the best break in my day. I get to relax and appreciate my body for what it’s just done for me, while at the same time letting all the things I worry about on a daily basis leave my head. 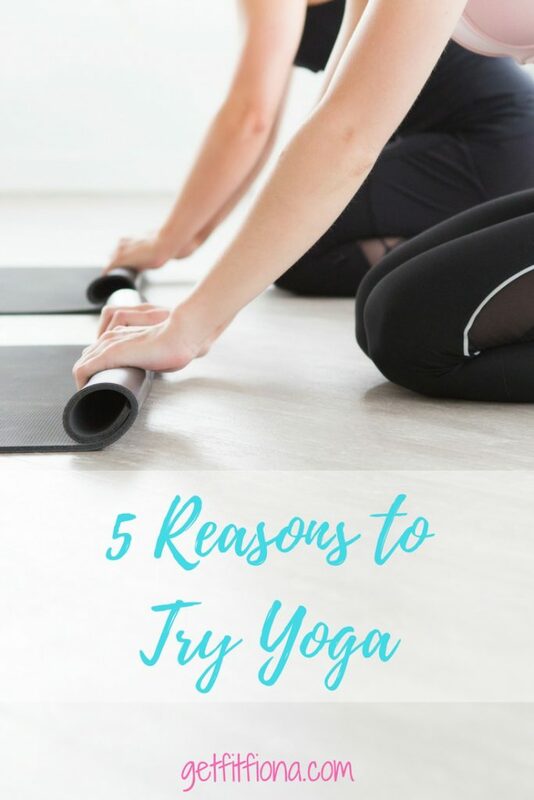 What’s your favourite reason to try yoga? I even got my dad hooked on yoga. He’s not very flexible either but really enjoys it.